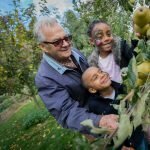 Since 2011 the Urban Orchard Project has been working with communities to restore old and neglected orchards through programmes of educational sessions on restoration pruning. These old orchards have much value, in terms of biodiversity, amenity, food source, genetic, local distinctiveness and intrinsic worth. In the UK, we have lost over 60% of our traditional orchards since the 1960s. In London, due to rapid development and the expansion of the suburbs many orchards were grubbed up, or ended up fragmented in gardens. Take a train from Waterloo towards the Merton area and you’ll pass garden after garden each with a mature apple or pear. Orchard restoration at Bethlem Royal Hospital, Winter 2010 from The Orchard Project on Vimeo. These last remnants are worth saving; they may have high biodiversity, cultural, heritage and genetic value, and very few people are actually planting traditional orchards these days: modern commercial growers favour small, shorter lived trees. Our aim is to work with communities to improve the health of these orchards, thereby extending their lives to ‘buy time’ to plant replacement trees that will grow mature enough to provide habitat for the wild life once the old trees die. This habitat continuation also helps to keep these local features in place, increases interest in them, making it more unlikely that they’ll be grubbed up, and allows us time to propagate new trees from the old, preserving the genetic diversity being lost rapidly from our food crops. You’ll then need to find a local group who are willing to get involved in the project. Start by contacting local wildlife trusts, conservation groups, ‘friends of the park’ groups. Most of our restoration projects so far have been with local perk conservation volunteer groups. This has worked really well as they’re usually very keen, attend regular sessions and so know each other and work well together. A member of the UOP team usually starts by giving an introduction to the day, including background and H&S. A trained workshop leader (either a consultant or experienced member of UOP) will then walk the orchard with the group, pointing out features of interest and good examples of branches needing removal before carrying out a demonstration pruning on a tree. This includes how to make a cut and undercut. The group is then asked to get into groups, gear up and pick a tree, then discuss between them which bits they might prioritise for removal. Each group then shares their thoughts with the leader, who agrees or disagrees and offers pointers to get them going. Each group then works on their tree, with guidance when required from the leader, before moving onto the next tree. This is something that comes with practice and there is no substitute for on the ground training and learning through doing. The following serves simply as a guide. See the link to Natutal England’s guide on restoration below. Fruit trees are early senescent hard wood trees which means that they develop veteran tree characteristics (hollowed out heart wood, rot holes) earlier in their lives than trees such as Oak. This makes them excellent habitat for a range of wild life and this needs to be considered throughout any work carried on old trees. Fruit trees in orchards have been shaped by people through pruning; these shapes are therefore not natural. As a result, if the trees become neglected, new growth can cause imbalance and overcrowding in the canopy, and this can lead to disease and loss of whole scaffold branches due to over burden. The latter is a common way in which old trees are lost; the old scaffold branches have become hollowed out naturally become over burdened with vertical summer ‘water shoots’ that have been left to grow into large diameter branches. These young branches, ‘trees on trees’, are dense and their weight, combined with a large crop can be enough to break to the whole tree apart. The key aims for restoration are to: reduce the height of the tree, reduce the weight load on the scaffold branches, re-open the canopy for light and air penetration, remove diseased and some dead material. Do not be too quick to remove all dead wood from the canopy; standing deadwood (as opposed to dead wood on the forest floor) is valuable habitat for a range of organisms. Small diameter wood (branches, twigs) can be taken out, but larger diameter dead wood that is obviously safe, in the sense that it won’t fall onto someone, can be left as habitat. Further guidance here about diseased wood….Bob?